War on war! Not a single drop a blood for the “nation”! The power struggle between oligarchic clans in Ukraine threatens to escalate into an international armed conflict. Russian capitalism intends to use redistribution of Ukrainian state power in order to implement their long-standing imperial and expansionist aspirations in the Crimea and eastern Ukraine where it has strong economic, financial and political interests. On the background of the next round of the impending economic crisis in Russia, the regime is trying to stoking Russian nationalism to divert attention from the growing workers’ socio-economic problems: poverty wages and pensions, dismantling of available health care, education and other social services. In the thunder of the nationalist and militant rhetoric it is easier to complete the formation of a corporate, authoritarian state based on reactionary conservative values and repressive policies. In Ukraine, the acute economic and political crisis has led to increased confrontation between “old” and “new” oligarchic clans, and the first used including ultra-rightist and ultra-nationalist formations for making a state coup in Kiev. The political elite of Crimea and eastern Ukraine does not intend to share their power and property with the next in turn Kiev rulers and trying to rely on help from the Russian government. Both sides resorted to rampant nationalist hysteria: respectively, Ukrainian and Russian. There are armed clashes, bloodshed. The Western powers have their own interests and aspirations, and their intervention in the conflict could lead to World War III. Warring cliques of bosses force, as usual, force to fight for their interests us, ordinary people: wage workers, unemployed, students, pensioners… Making us drunkards of nationalist drug, they set us against each other, causing us forget about our real needs and interests: we don`t and can`t care about their “nations” where we are now concerned more vital and pressing problems – how to make ends meet in the system which they found to enslave and oppress us. We will not succumb to nationalist intoxication. To hell with their state and “nations”, their flags and offices! This is not our war, and we should not go on it, paying with our blood their palaces, bank accounts and the pleasure to sit in soft chairs of authorities. And if the bosses in Moscow, Kiev, Lviv, Kharkiv, Donetsk and Simferopol start this war, our duty is to resist it by all available means! 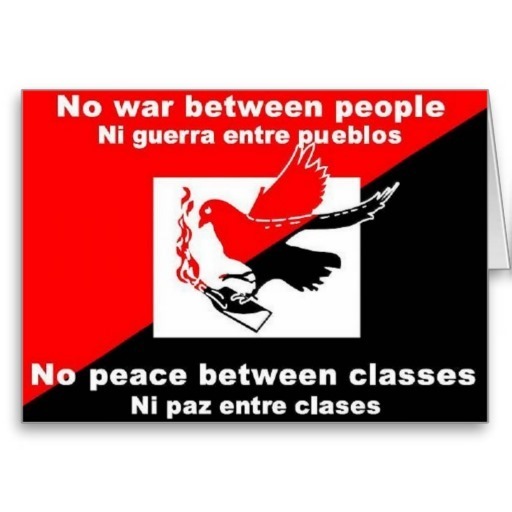 No war between “nations”-no peace between classes! This entry was posted in ΘΕΩΡΙΑ, ΝΕΑ ΑΠΟ ΤΟ ΜΕΤΩΠΟ and tagged ΑΝΑΔΙΑΡΘΡΩΣΗ, ΚΑΤΑΣΤΟΛΗ, ΚΡΑΤΟΣ, ΟΥΚΡΑΝΙΑ, ΡΩΣΙΑ on March 2, 2014 by simeioseis.